The Lost & Found 55K is a modified multi loop course. 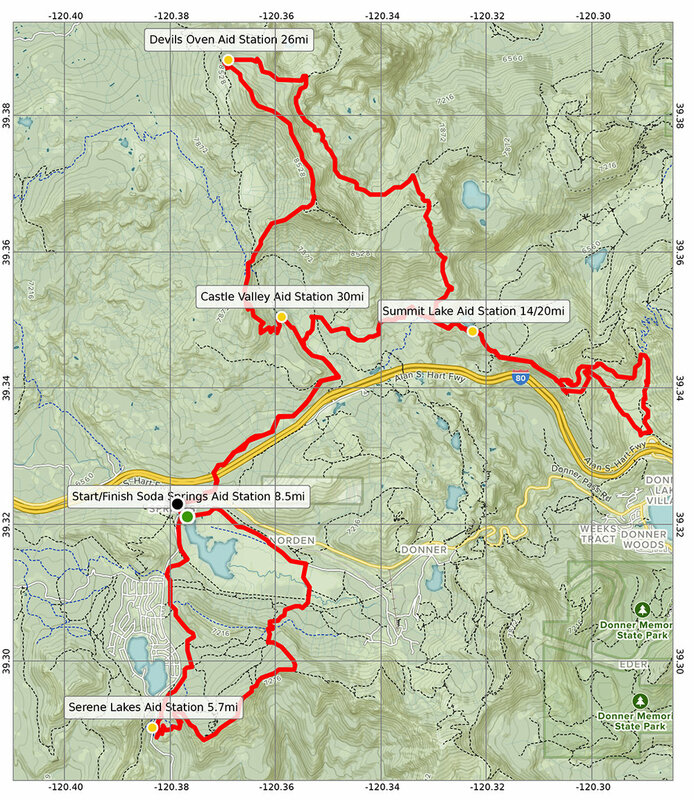 The start/finish is next to Lake Van Norden across from Soda Springs Ski area. It begins with a loop up to Razorback Ridge then back to the start before heading under I-80 through the culvert. Take the single track over to the Donner Lake Rim Trail to picturesque Summit Lake Aid station as you wind through ancient granite slabs. Then return back and join the Warren Lake trail which continues to climb up next to the Frog Lake overlook. You then fall off the ridge where you will find miles of wildflowers and little streams as you make your way through this pristine alpine valley. The climb up to Basin Peak will test your mettle— but then the reward is real as you follow along the most amazing ridge with 360' views from the Coast Range to Mt Rose while summiting Castle Peak. Enjoy the views before you plummet down to Castle Pass, hop on the Hole in the Ground Trail and head back to the start/finish. Approximate elevation gain is 6000 feet. The 55K start time is 7 am. For All-trails map link click here.